Swami Sivananda Saraswati was a Hindu spiritual teacher and a proponent of Yoga and Vedanta. He was born Kuppuswami in Pattamadai, in the Tirunelveli district of Tamil Nadu. 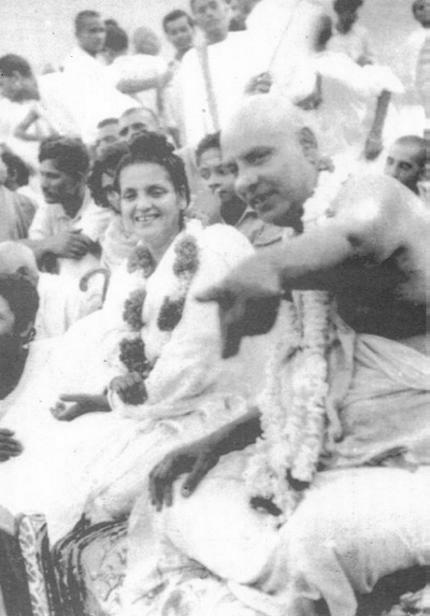 Sri Sri Ma meets Swami Sivananda (in June 1956) Sri Ma reached Rishikesh on 6th June. She stayed at Paramartha Niketan, an ashram on the banks of the Ganga, founded by Swami Sukdevanand. 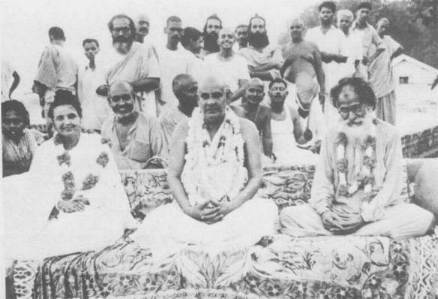 During her stay there Sri Ma one day accompanied by Sri Hari Babaji Maharaj and others , crossed the river by boat to pay a visit to the Ashram of Swami Sivananda, founder of the famous Divine Life Society. The Swamiji and the ashramites welcomed Sri Ma and showed her round the ashram. He also sang some kirtans in Hindi and English.After taking meals there Sri Ma and the party left. On 13th June Sri Ma suddenly left for Benares.